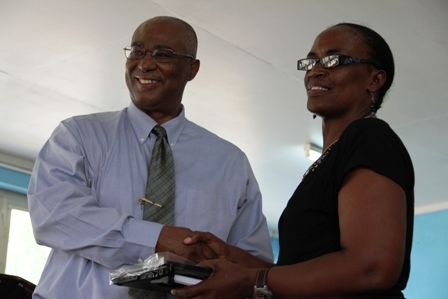 NIA-CHARLESTOWN NEVIS (April 11, 2011) — Amid words of gratitude to those who made the laptops possible for students on Nevis, Principals of the three secondary Schools pushed for students to care for the devices and to give back to the community in exchange for the invaluable gift. They were at the time receiving a laptop each under the One-to-One Laptop Programme from Premier of Nevis and Minister of Education Hon. Joseph Parry, on Thursday at the Charlestown Secondary School (CSS) Auditorium, one day ahead of the distribution to all 5th Formers on the island. Mr. Edson Elliott Principal of the (CSS) in his response said when he first heard of the project he thought it was a dream but assured that it had become a reality on Thursday afternoon. “We know the importance of technology in this age, we know the importance of the computer and even though we may have been doing well all along, I believe that the computer would put us in a better position. So we would like to thank all those persons who contributed. 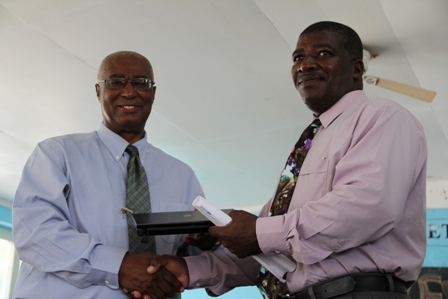 The computers are just in time for those of us who will be going off to continue to prepare for our CSEC Examinations,” he said. However, he also used the opportunity to put in a bid for teachers to be included in the programme which would eventually provide a laptop for each student at the island’s secondary schools. “Certainly the computers would give a sense of expectation to our teachers because in education, we never leave the teachers behind. As a matter of fact the teachers should be in front. “Since we have equipped our students with laptops, we anticipate that the teachers too will be equipped and will be in a position where they will be able to guide the students with the use of the laptop. So once again on behalf of the Charlestown Secondary School we give thanks to all those persons who are responsible for this worthwhile project,” he said. Meantime, Principal of the Gingerland Secondary School (GSS) Mrs. Dawn Jeffers while she thanked both the Taiwanese and Federal Governments who helped to make the programme a reality for the students admonished them to be grateful for the investment made in them. “My admonition to you though students, is whenever persons take time to invest in you, you must redeem that and give back something equally if not over and above the value that you have received. I believe that it would have taken members of the Government sometime to negotiate giving you this laptop. It means that you must reciprocate and you must put back into your community some of what has been given to you. “I don’t want to be negative but sometimes we can be very ungrateful in Nevis and I am asking you as children to begin to be the leaders to show some gratitude for that which has been invested in you. You, your parents and the community I am really calling on this afternoon to begin to say thanks,” she said. Principal of the Lyn Jeffers Secondary School Mrs. Jacqueline Jeffers also registered thanks on behalf of the students and parents to those involved in the project. “On behalf of the staff, students and parents of the Lyn Jeffers School, I stand to give thanks to all those who were involved in this project. I have one regret though and that is it didn’t come before the SBAs were finished because students would have had to have their SBAs in by this week since we have to have the marks in next week. “However we are still very grateful for the laptops but since the laptops are not for the teachers I would like to call one of my students and at this point hand over to the student Triffon Simmons. What I would like to say to Triffon and the other students is please take very good care of the laptops, use them wisely,” she said. 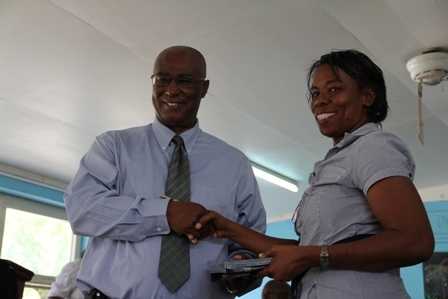 The ceremony was chaired by Principal Education Officer on Nevis Mrs. Lornette Queeley Connor. 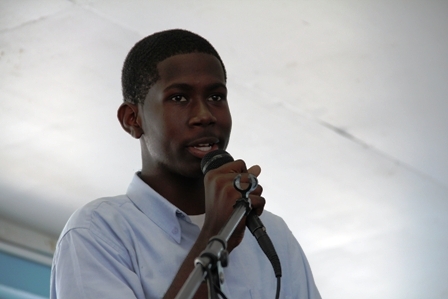 The Vote of Thanks delivered by President of CSS Students Council Mr. Theon Tross.